Get your desired body by multiple and persistent rowing exercises on this Genki Rowing Machine Magnetic Fitness Exercise Equipment Home Workout Rower - Red. This rowing machine utilizes magnetic resistance for working toned back, legs, arms and abs as well as getting great cardio health in a quiet yet smooth way. Featuring eight adjustable resistance levels, this rower will meet your different training purposes. It includes a large easy to read LCD monitor that displays time, count, distance, calories and strokes per minute for everyday workout routines. The fully padded and large size seat offers maximum comfort on each and every rep during exercise. Made of durable steel material and equipped with non-slip handlebars, anti-slip foot pedals and adjustable foot straps, this air rower ensures secure smooth glide even under high intensive workout. Foldable, portable and compact construction makes it easier to place it against the wall or under other furniture. Set sail for a full body training with this rowing exercise machine. Could not be happier There are many levels of tension and since you are 100 in control of your workout you get what you put into it. I expected it to be solid but was amazed at the quality. The pulls and slides seat are very smooth and very quiet. Very happy with it It was very easy to assemble. It took only 30 minutes for my husband to put it together. I was amazed at how quiet it is and how smooth it glides. Very easy to use. Been using it already for a month and a half and I am very satisfied. It is a decent workout and I already notice that I have loss some weight. High quality easy assembly and superior to one I use at a fitness center. Very sturdy super smooth and quiet My husband is at the top of the recommended weight and there is no problem at all. Like this especially because the seat is very comfortable. No issues with displays like some mentioned and it went together very quickly. No issues yet and have been using for a month. 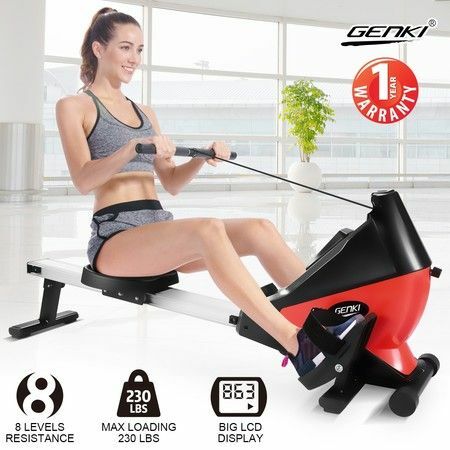 My wife and I have been using this rowing machine for almost a month and are quite satisfied with it especially given the sale price. And the warranty is for 1 years and it seems to be well-built..